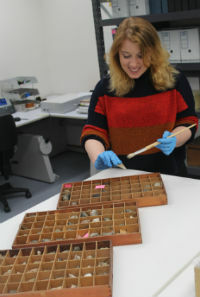 Spending four weeks at the University of Melbourne as the 2017 recipient of the International Museums and Collections Award, Katherine was given the task of researching a wooden box containing approximately 200 geological specimens from the F.A Singleton Earth Science Collection. With little known about the age or history of the box, Katherine set out to discover its secrets which, as it turned out, were neatly wrapped in scraps of paper and newspaper print used to protect the specimens. Scraps of The Times of London revealed that the collection was assembled during the 1840s and 1850s with the latest date found being 25 December 1854. A scrap of writing paper with a neatly written name on it also identified the most likely original owner: John Macadam Esq MD. John Macadam (1827–1865) was a Scottish analytical chemist and doctor who immigrated to Australia in 1855 to take up a teaching role in chemistry and natural science at Scotch College, Melbourne. Macadam went on to be appointed lecturer in Chemistry at the University of Melbourne in 1862 on the establishment of the Medical School. And for the macadamia nut? This uniquely Australian nut was named for Macadam when it was first scientifically described by his friend German-Australian botanist Ferdinand von Mueller in 1857.